Two market comments per day including the latest analysis on the major market indices using a range of proprietary technical indicators and macro-economic themes. Speculative index call or put buy recommendations are issued based on this analysis. Including follow-up action, trading stops and position analysis. Strategies include option buying, ratio spreads, calendar spreads, bull & bear spreads, condors, straddles, covered call writing, naked put selling, volatility trading, and much more. A daily scan of momentum and put-call ratio signals including specific option trading recommendations on stocks, indices and commodities. A daily evaluation of stocks with implied volatility skews complete with appropriate trading recommendations. A daily list of our most attractive straddle and strangle buy candidates using a wide variety of proprietary systems including our earnings-driven straddle recommendations. A daily scan of naked put sale candidates using our expected return analysis. Email updates throughout the trading day containing instructions regarding establishing new and adjusting open positions. Pertinent charts and graphs illustrating important positions, studies, and ideas (put-call ratio signals, price action, support & resistance, term structure, McMillan Oscillator, volatility & variance futures, etc). Tables detailing lists of valuable data (momentum signals, put-call ratio signals, volatility skews, straddle buys, naked put sales, etc). Daily in-depth analysis and commentary on the current volatility and variance derivatives markets and what they're saying about the stock market. Each subscriber will also receive a subscription to the industry best Option Strategist Newsletter and its weekly Hotline updates. 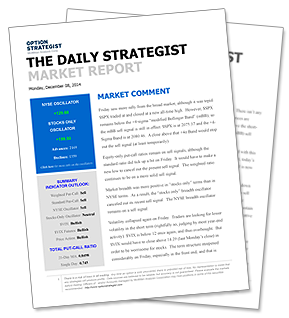 Published and delivered each trading day at the market open, The Daily Strategist Market Report keeps subscribers in tune with the current environment with a morning Market Comment drawing from a range of proprietary technical indicators and macro economic themes. NYSE and Stocks-Only Oscillator readings are reported for the previous trading day along with new Put-Call Ratio and Momentum buy and sell signals. Speculative recommendations may be presented based on these signals. Computer-Generated, Confirmed and Past/Active buy and sell signals are presented on a daily basis. The put-call ratios are contrary indicators. Essentially, when there is "too much" put buying, indicating that the public is bearish, the contrary trader should consider buying that market. Conversely, if there is "too much" call buying, we would look for a place to sell the stock short or buy puts. We use a trend-following system for these speculative positions. In general, the system has two criteria for a "setup": 1) the underlying instrument is trending, and 2) it must have pulled back then resumed its trend. A proprietary indicator based on put-call ratios and extreme volume patterns. One of primary volatility trading strategies is straddle buying. We do a number of statistical and probability analyses, and only the potential straddle purchases with the highest expected returns make this list. This table will normally contain several items. This next section of the "Volatility Report" contains situations where there is a large volatility skew - potentially large enough to trade. A volatility skew means that the individual options on this particular stock, index, or futures contract do not have the same implied volatility. In fact, they are so disparate - and generally there is a pattern to these disparities - that a spread can be established to take advantage of them. Our unique analysis presents a daily list of put-sale candidates all containing high annualized expected returns. TheVolatility Report also contains a section detailing follow-up instruction and summarizing past action. A full summary of current positions is also provided for easy reference. Daily Strategist Interim Reports are sent out to adjust open or establish new positions throughout the trading day. These timely updates provide valuable up-to-the-minute information.